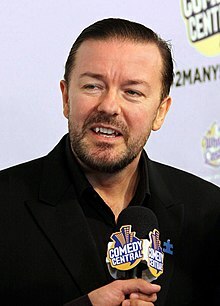 Ricky Dene Gervais (born 25 June 1961) is an English comedian, actor, director, presenter, singer and writer. He became famous with his show The Office. Gervais was born and raised in Reading, Berkshire, England. He was half of 1980s New Wave duo Seona Dancing. He is known for television series including The 11 O'Clock Show, The Office, Meet Ricky Gervais, Extras, An Idiot Abroad, Life's Too Short and Derek. He wrote a children's book, Flanimals. He has performed stand-up shows Animals, Politics, Fame and Science. He has starred in movies: Ghost Town, The Invention of Lying and Cemetery Junction. He has won seven BAFTA awards and two Emmy awards. Gervais hosted the Golden Globe Awards in 2010, 2011 and 2012. He is an atheist. He lives between Hampstead, England, and New York City with his partner, producer and author Jane Fallon. Gervais has said that they aren't going to get married because "there's no point in us having an actual ceremony before the eyes of God because there is no God". They have also chosen not to have children. ↑ "10 Great Ricky Gervais Quotes On Life, God, And Humor". PBH Network. ↑ Lee, Stewart (2010). How I Escaped My Certain Fate. Faber and Faber Ltd. ISBN 978-0-571-25482-8. ↑ 3.0 3.1 3.2 3.3 "Ricky Gervais 2008". Hyena Production. Retrieved 23 May 2015. ↑ Gilbert, Matthew (27 September 2009). "Lining up for Ricky". Boston.com. Retrieved 23 May 2015. This page was last changed on 22 March 2019, at 18:44.